DUNES International School Al Khobar connects with all Indian hearts to commemorate the grand historical event when India was recognized globally as a democratic republic on Jan. 26, 1950. The prominent institution of the Eastern Province congratulates every Indian in the Kingdom and those residing even in the remotest parts on the planet on the 68th anniversary of the Republic Day of India. The Indians among the students and staff at Dunes are imbued with patriotic fervor and festivity reflecting the tricolored social fabric, dauntless pride and infinite love for their native country on the holy land of the KSA. 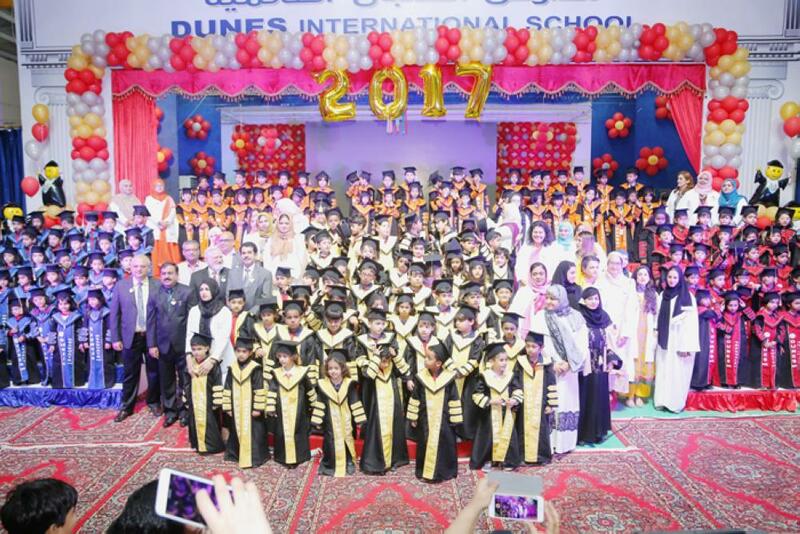 Established in the year 2011, Dunes International School has managed to attain an exalted status among the best institutions of the Eastern Province. The school now accommodates 1,700 students from a variety of nationalities in academic ambience in the separate sections for boys, girls and kindergartners. The Chairman Dr. Ibrahim H. Al-Quayid and Managing Director Dr. Nadeem A. Tarin have at all times ensured since its setting up that Dunes is committed to strive to provide excellent instruction, programs, and facilities for children of Indians and diverse nationalities on expatriate assignments in Al Khobar, Dammam and Dhahran. Saad Tarin, deputy general manager, has not allowed anyone to deviate from the founding ideals, which are based on developing in the students a deep and meaningful awareness and understanding of culture and the diversity of cultures around the world. Director Sultan Salman Al-Terais Sadey aimed at producing well equipped futuristic global citizens through first rate modern education for each student during their school years at Dunes. Director Awad Al Qahtani ascertained that the institution abides by the laws of the Kingdom meeting the tall standards and expectations of the formulated educational structure. Director, Amjad Khan knew that being an international institute hosting students from all over the world, the school would confront special challenges due to different expectations in schooling as experienced in native countries. He worked relentlessly to make Dunes comparable to, and, in fact, become better than other established international schools in the region. Dr. Saleem ur Rehman, director academics, emphasized on qualitative outcomes in both internal and external evaluations. He helped enhance staff competencies through rigorous professional development programs by laying emphasis on teachers’ and leadership trainings. The Principal Dharminder Menon and Headmistress Ms. S. Tasneem for CBSE Section were instrumental for the continuous evolvement of the teaching strategies to equip students with skills and competencies in preparation for their entry into a world beyond school. The Principal Mohammed Aamir Khan and the Academic Coordinator Ms. S. Junaidi, for International Section, provided a plethora of opportunities to all students to develop the 21st century skills to transform themselves into value-driven, versatile and well grounded global citizens. The recent induction of experienced hands in educational field, Jamal Khan, Ms. Ariba Shahnawaz, Ms. Ayesha Rehman and Ms. Baseera Ayub proves that the management is dedicated to the continuous improvement and development of constructive relationship with all stakeholders thereby creating a positive school climate, which helps to extend a caring and responsive school community. Located at old airport road and easily accessible from Dammam, Dhahran and Al Khobar, the school is well recognized among the communities of expatriates for advanced teaching practices with smart classes, e library, Speak Up, 3G ABACUS program, educational workshops, seminars, contests, sports events and community building programs. One of the most prestigious schools of the province, Dunes houses state-of-the-art infrastructure with well furnished classrooms, equipped laboratories and libraries, large playgrounds, swimming pool and spacious auditorium. Everyone among the staff is dedicated to sustain a teaching and learning environment, which is conducive in accommodating a variety of extracurricular activities. A wholesome and balanced curriculum, up to date pedagogy and professionally skilled, richly experienced faculty in both boys and girls sections and well knit transport arrangements have been the supreme assets to the institution. Instilling in each a conscientious individual, who develops fully in intellect, art, talents and education to the highest degree and exalted sense of life, inspiring each to transcend barriers, overcome odds and work in unison to bring about positive change in society while retaining humility and values are the kind of students Dunes aims to produce, shape and groom. It radiates an atmosphere that values achievements, molds character, enriches minds and imparts essential values. Further, the school provides the diverse student body with exceptional education, instilling in young people a love for learning, the ability to think independently, and the confidence to pursue their dreams and goals. Dr Tarin, a veteran expatriate in the KSA, prominent entrepreneur, seasoned educationalist and known philanthropist has developed many successful schools across the Kingdom. He has always striven towards impacting the community by undertaking outreach initiatives and environmental projects. He envisions Dunes International School to be the best in its class in the Eastern region. He aims at establishing institutions with better infrastructure, enhanced IT and other resources to augment student learning and assessments across scholastic and co-scholastic areas. On the growing recognition and pressure of new admissions at Dunes International School Al Khobar, the governing committee is working on a revolutionary school expansion project on 23,000 sq meters outfitted with ultra modern infrastructure and serene learning environment accommodating 5,000 students. After the successful launching of an international school at Buraidah in April 2016, two more international schools will be operational at Shaqra and Jubail by April 2018.